Their award-winning cheeses could not be made anywhere else and taste the same. 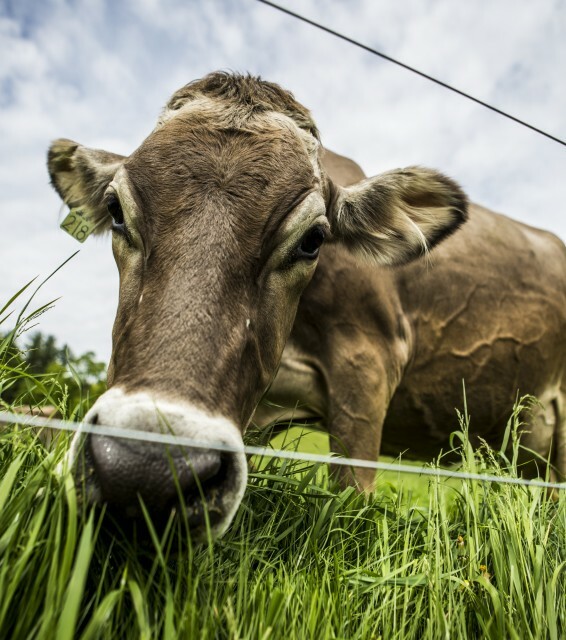 The characters and flavors are born from the cow’s milk that is flavored with the grass the cows eat, which picks up certain hues from the unspoiled Adirondack soil where it's grown. Then the wheels of cheese are infused with spruce from the locally-milled pine boards on which they are aged. 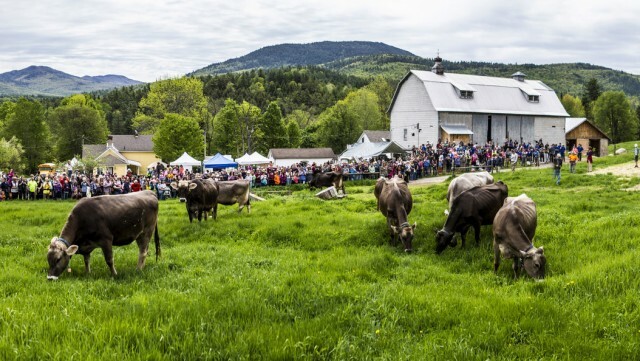 This is all to say that Sugar House Creamery cheese is quintessential Adirondacks. “We wanted to be a regional specialty, like another feature of the Adirondacks that makes this place unique,” said creamery co-owner Margot Brooks. The picturesque Sugar House Creamery farm sits on 22 acres in Upper Jay with a barn housing a small herd of 12 impossibly adorable Brown Swiss cows. A cheesemaking facility was built adjacent to the barn and milking parlor, with a cheese cave dug 18 steps down into the ground from the cheese making room. Margot and partner Alex Eaton, both 32, are the couple who purchased the property in 2012. They now join a cohort of young farmers in this area between the Adirondack foothills and Lake Champlain who are also making dairy products, churning butter, raising chicken, pork and lamb, and brewing beer. There’s a highly popular cheese tour each fall as well. Brooks and Eaton encourage people to come visit the farm to see how the cheese is made. Eaton said they often tour people around the property and showcase their small production. “It’s important for people to know that we take pride in our sustainable practices and the cleanliness of our facility. People should feel good about where their food is coming from,” Eaton said. The creamery’s on-site farm store carries their three cheeses, raw milk, and a few other products from local farms. So, to the star of the show - the cheeses. Their mainstay is called Dutch Knuckle, which is made from raw milk. Margot explained it’s an Alpine-style cheese modeled after an old-world Swiss appenzeller recipe, with a few tweaks. It’s nutty, buttery, meaty, dense, and pleasing to a variety of palettes. It’s aged eight months. “It’s a hearty mountain cheese - the one you would throw in your backpack and eat on a hike,” Margot said. Margot and Alex met while attending St. Lawrence University. Margot, who grew up on a dairy farm outside of Cooperstown, knew she wanted to farm and make cheese. Alex, a Vermont native, was keen, yet slightly naive about farming. Upon graduation in 2008, the both spent five years at Consider Bardwell Farm, the renowned cheese mecca in Vermont. Margot was making cheese while Alex was managing the farm. To this day, they have maintained those roles at Sugarhouse - not to say they don’t all pitch in and do what it takes to keep the place running. They closed on the Upper Jay property in 2012 and spent the winter and spring constructing, excavating, and writing their business plan. It’s small-scale sustainable farming. They employ rotational grazing techniques, spread the cow’s effluent on the fields, which makes great hay for them to eat. They hired one employee and the three of them do it all - mucking, raking, milking, fixing equipment, running the store. At the top of their priority list is to not grow any larger. They make about 12,000 pounds of cheese a year, and they like it that way. 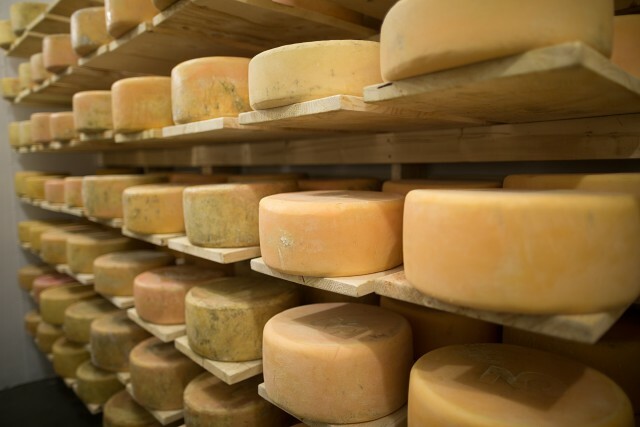 Their cheeses enjoy local notoriety and are used in many area restaurants. To buy some for yourself, you can visit the farm store that is open Wednesdays, Saturdays, and Sundays. Or, they can be found at the farmers' market in Saranac Lake on Saturdays from 9 a.m. to 2 p.m., and Keene on Sundays from 9:30 a.m. to 2 p.m. Hiking or biking and eating fresh cheese go together like Batman and Robin, which is to say, perfectly. Why not book a few days here and enjoy our scenery and farm fresh specialties?